According to Greek mythology, Agamemnon was the king of Mycenae, a kingdom of legendary Greece. The leader of the Greeks in the Trojan War*, he is one of the central figures in the Iliad, Homer's epic poem about the war. Greek writers generally portray Agamemnon as courageous but also as arrogant and overly proud, flaws that sometimes cause him misfortune and eventually lead to his death. The story of Agamemnon is often seen as a warning about the dangers of hubris. Agamemnon's Background. Agamemnon was one of two sons of Atreus, the king of Mycenae. While Agamemnon was still a youth, Atreus was murdered by his brother. Agamemnon and his brother, Menelaus, fled to the city-state of Sparta, where they found refuge and protection from King Tyndareos. The king gave his daughters to the brothers as wives. One daughter, Clytemnestra, was already married, but Agamemnon killed her husband, Tantalus, and then married her. Menelaus took her beautiful sister Helen as his bride. Agamemnon later returned to Mycenae, killed his uncle, and reclaimed the throne of his father. He and Clytemnestra eventually had three daughters—Chrysothemis, Electra, and Iphigenia—and a son, Orestes. Meanwhile, Menelaus became king of Sparta after the death of Tyndareos. Some time later, Paris, the second son of King Priam of Troy, visited Menelaus in Sparta. The goddess Aphrodite* had promised Paris earlier that he would have the love of Helen, the most beautiful woman in the world. When Paris returned to Troy, he took Helen with him. At the time of Menelaus's marriage to Helen, all the rulers of the Greek city-states had promised to come to her defense if necessary. Menelaus reminded them of their promise, and they agreed to go to war against Troy to bring Helen back. Agamemnon was chosen to lead the Greeks in battle. Agamemnon prepared a fleet of ships to carry the Greeks to Troy. Just before the ships were ready to sail, however, he insulted the goddess Artemis* by boasting that he was a better hunter than she and by killing a sacred stag. As punishment, Artemis caused the winds to die down so that the Greek fleet could not sail. Greek myths reflect a view of life very different from that expressed by the earlier myths of Mesopotamia*. The Mesopotamians regretted the fact that humans could not live forever like the gods. Their mythical heroes sought eternal life even though the gods showed them that they were doomed to fail. By contrast, one of the basic ideas of Greek mythology is that all humans have a fate that cannot be escaped and limits that they should not try to exceed. The Greeks believed that individuals must face their fate with pride and dignity, gaining as much fame as possible. People—such as Agamemnon—who believed they could change fate by their own actions were guilty of hubris. They would eventually be punished by Nemesis, the vengeance of the gods. A seer told Agamemnon that he could please Artemis and gain favorable winds by sacrificing his daughter Iphigenia to the goddess. The king tricked Clytemnestra into sending Iphigenia to him by saying that she was to marry the great warrior Achilles*. When his daughter arrived, Agamemnon killed her. Although the sacrifice pleased Artemis and allowed the Greek ships to sail, it would later have terrible consequences for Agamemnon. The Trojan War. The Greeks fought the people of Troy for nine years and seized many of their cities. However, they failed to capture the city of Troy. This is the point at which the Iliad begins, and Agamemnon's arrogance and pride come into play again. After winning a battle against the Trojans, Agamemnon received a female prisoner named Chryseis as part of his booty. The girl was the daughter of Chryses, a priest of the god Apollo*. Chryses begged for the return of his daughter, but Agamemnon refused. Angered, Apollo sent a plague to devastate the Greek forces. The hero Achilles demanded that Chryseis be returned to her father. Agamemnon still refused. He finally agreed on the condition that he be given Briseis, a female slave of whom Achilles had grown very fond. Achilles became so angry that he laid down his arms and refused to fight any longer. This proved to be a costly mistake because without Achilles the Greeks began to lose badly. Achilles returned to the battle only after learning of the death of his close friend Patroclus. When he rejoined the Greek forces, the tide of battle turned. The Greeks drove off the Trojans, killed the great Trojan warrior Hector, and went on to defeat the people of Troy and destroy their city. After the war, Agamemnon took the Trojan princess Cassandra back home as a prize. Homer's epic poem the Odyssey tells the story of Agamemnon's return to Mycenae. The Death of Agamemnon. While Agamemnon was away fighting the Trojans, his wife, Clytemnestra, took a lover named Aegisthus. As Agamemnon sailed home from Troy, Clytemnestra was plotting to kill him in revenge for his sacrifice of their daughter Iphigenia. In the meantime, Cassandra, who had the power to foretell the future, warned Agamemnon that his wife would kill him. However, the gods had put a curse on Cassandra: although she would make accurate predictions, no one would believe them. True to the curse, Agamemnon ignored Cassandra's warning. When Agamemnon returned home, Clytemnestra welcomed him by preparing a bath in which he could purify himself. As the king stepped out of the bath, however, Clytemnestra wrapped him in a garment or a net that bound his arms so that he could not move. Aegisthus then stabbed Agamemnon to death while Clytemnestra killed Cassandra. It is also said that Clytemnestra herself slew Agamemnon with an ax. Agamemnon's son Orestes eventually avenged the murder by murdering both Clytemnestra and Aegisthus with the help of his sister Electra. Agamemnon in Literature. Agamemnon is a favorite character in many works of literature besides the Iliad and the Odyssey. The ancient Greek playwrights Aeschylus, Euripides, and Sophocles wrote a number of plays based on the life of Agamemnon. He was also a popular subject of ancient Roman authors such as Ovid and Seneca. Later writers, including William Shakespeare and French playwright Jean Racine, included Agamemnon as a character in their works. In modern times, Agamemnon has served as a model for characters in works by poet T. S. Eliot and playwright Eugene O'Neill. 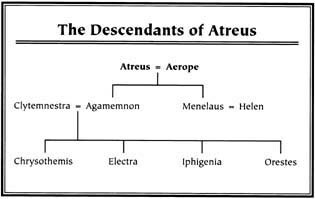 See also Achilles ; Aphrodite ; Apollo ; Cassandra ; Clytemnestra ; Electra ; Greek Mythology ; Hector ; Helen of Troy ; Homer ; Iliad, the ; Iphigenia ; Menelaus ; Odyssey, the ; Orestes ; Paris . The story of Agamemnon's Death is an amazing story! you should have the time periods of when each event occurred.